Yesterday I organized my father’s “framing shed” workshop and found some of my old oil paintings that I painted from about ages 12-17. The two paintings below are framed and hanging in the house. Discovering the unframed paintings instigated this trip down memory lane and I thought I would share some of my first paintings with you. Lila decided to make an exception and give me a spot in her Saturday morning oil painting class. I remember there were about five or six students at the time. I was the youngest at 12, the next was a young man who was about 17 or 18, and the others were in their 40s and older. I don’t remember all their names, but I remember some details of my fellow painters. One dark-haired woman, possibly in her late 40s, always dressed up for class and never spilled one drop of paint on her white-colored clothing. She wore a simple white smock/apron and never got paint on it either. I, on the other hand, occasionally used my clothing as a wipe rag (much to my mother’s chagrin). Another woman, probably in her 50s or 60s at the time, was a retiree named Violet Treasure, who wore her silver hair in a bun perched on top of head. Hers was such an unusual name that I thought it couldn’t possibly be her real name. I did an online search but can’t find anything about her, unfortunately, but I never forgot her name. She painted on really large canvases and almost always painted female nudes. She was a supremely talented painter. I marveled at her use of color—where I tended to see skin as one tone of beige, her brush strokes infused purple, lilac, pink, green and every other hue into the figure. I would learn just how difficult this was when I attempted to copy a painting of a young Native American girl. Initially, my subject was just one shade of brown (think coloring book style) and it was just so flat and uninspiring. Under Lila’s patient guidance, my subject’s skin began to reflect all those colors that Violet used in her paintings. I never did master skin tones but I had an instant respect for Violet’s painting skills. The young man’s last name was Somerville (or Summerville), but I don’t recall his first name. My dad, who was in Customs at the time, worked with his father, Red Somerville, who was an immigration officer at the port near Nuevo Progreso (which was a mere eight miles from where we lived in Donna, Texas). I remember how slowly he painted and how meticulous he was. He hardly uttered a word while he was in class—he was too intent on replicating works of the masters. (He would have done incredibly well as a forger!) 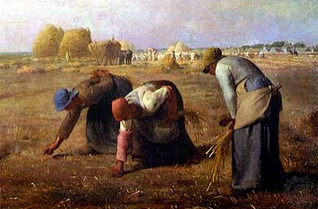 One painting I remember him copying was The Gleaners, an oil painting by Jean-Francois Millet. I always aimed to finish a painting in one or two weekends (impatient even at that young age, I was). He, on the other hand, spent three hours painting just the hands of the wheat gleaners! I marveled at his patience and expertise. When I moved on to a new painting instructor in a different studio, he was still working on his copy of The Gleaners! There was a pass-through from Lila’s studio to her dining and living room, where her husband, Neil Giles Prater, was bedridden with a long-term illness. I just did a search online and learned that he died at age 83 on June 10, 1977 of pneumonia. I actually spoke with Lila sometime in the 90s and she was about 92 years old then. She was in an assisted living home and had lost her eyesight. She remembered me and some of the images I painted. I just did a search and found that one of her two daughters passed away in 2010 and the obituary indicated she was preceded in death by her parents, Lila and Neil. Further research revealed that there was a Lila V. Prater, from Weslaco, Texas, who lived to 107 and died in 2003, and I’m pretty certain she’s one and the same Lila Prater. 107 years old—amazing, isn’t it? Lila had a huge filing cabinet that she called “the morgue,” where we could sort through and find an image to paint. As a rookie, I invariably chose images to copy that were well out of my scope, and Lila would encourage me to pick another. Sometimes she won, sometimes I did. My first painting was a landscape, and the very next painting was the first floral piece below, done on an 11×14 canvas. When I picked the painting I wanted to copy, she said it was too soon for me to do such a detailed work. I pleaded with her, stating it was to be a gift for Mother’s Day. She relented and I faithfully replicated the work. When I was 15, I painted the second floral, a 24×36 canvas, as a present for my mother. By copying the work of other artists, I learned myriad painting techniques and color combinations. Lila also taught me how to use the grid method to enlarge or transfer an image to a canvas. Learn more about the grid method here. For this posting, I’ve made both images the same size, although there is a huge difference between them in reality—11×14 vs. 24×36. I studied under Lila’s direction for about five years and rarely missed a painting session. She was a wonderful teacher and gave me a great foundation in painting. When I was about 17, I began taking lessons with another instructor, Richard (last name escapes me) in Donna, Texas. His teaching method was vastly different from Lila’s—he didn’t allow us to copy anything and we had interesting exercises like using limited palettes of black and white paint only. 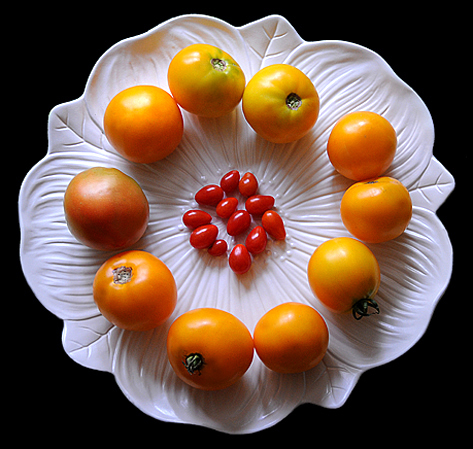 We did a lot of still life set-ups with fruit, bowls, vases and figurines. Re: framing—my dad would buy really beautiful but very inexpensive frames in Mexico to showcase my paintings. I remember that we would swap them out whenever I painted something new that matched the color of a particular frame! This weekend Regina and I joined Karen at her lake house for a girls-only retreat. Our friend Carmen drove all the way up from South Carolina to join us and Sue happened to be in town from Alabama and stopped by to join us for several hours on Saturday. En route from South Carolina, Carmen bought this beautiful bouquet as a lake house warming gift for Karen at a farmer’s market in Petersburg, VA. She called ahead to see if we had a vase available. Since we were already out running errands, I hunted an appropriate vessel (without even knowing the color scheme of the bouquet) and found this beautiful glass vase on clearance at a local Michael’s Crafts for just $4.00! Karen had the fabric handy in our project stash to serve as a table scarf (thanks to Sue for suggesting we scrunch the fabric). I added the glass bowl and Carmen added the yellow and purple bell peppers. She then declared, “what a lovely tableau.” I teased her about her “fancy college word,” but it was a perfect noun for the finished result. I have to admit I don’t remember ever hearing anyone actually use that word—maybe in college in Art Appreciation 101 class, perhaps? And in the end, as you know—I love any opportunity to shoot a photo, so this was a photographic-can’t-not! Floral arrangement courtesy of Carmen Mezzacappa. Vignettes from a day at Gay’s lake house on Lake Hamilton in Hot Springs, Arkansas. Photos © Cindy Dyer. All rights reserved. I while the idle hours away. Impervious to the sun and rain. Like torches down the path I tread. Lapping the steps beneath my feet. Here’s my first attempt at a Polaroid transfer created digitally. While I don’t think it’s a bad result, it’s a bit off from what a traditional transfer would look like. I’ll keep playing with it and report back if I find any tricks that better approximate what I could achieve with the original process. This afternoon I attended a baby shower and tea party for Elizabeth—a friend, neighbor, and “Weedette” in my Garden Club. Her first child, Baby “Snapdragon,” is due October 6. Elizabeth’s favorite colors are pink and green, so her friends decorated the party in that color scheme. Her friend hosting the party has worked as a caterer, so the food was delicious and beautifully presented, too. Elizabeth’s friend, Susan, a graphic designer, made the invitations, name tags, party favor hang tags, and a beautiful handmade guest book. Party favors included a white teapot-shaped teabag holder, a teabag, a baby carriage-shaped cookie, and a little tin of mints—all carrying the pink and green theme throughout. While I took a fair amount of people shots, I especially enjoyed photographing the flowers, decorations, and appetizers. Thanks for including me in your celebration, Elizabeth!